One of my favorite pieces of open source software is the vector graphics editor called Inkscape. While traditional graphics editing programs such as Photoshop or The Gimp are merely manipulating a rectangular grid of colored pixels, vector graphics tools use complicated mathematical descriptions of the lines, points, and objects in an image, which allows for perfect scaling of the images to any zoom level (among other awesome features). Inkscape is pretty great, and is freely available for Windows, OSX, and Linux. 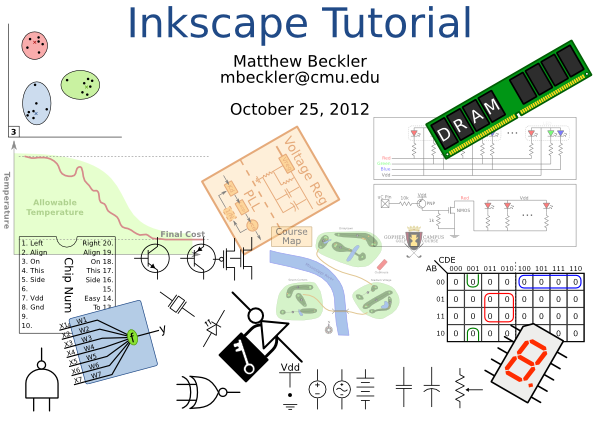 I’ve given an “Introduction to Inkscape” presentation a few times, and thought I would post the “slides” here to the blog. These aren’t like traditional powerpoint slides, be forewarned. Since the best way to learn how to use a program is, well, just to use it, I prepared a handful of Inkscape SVG documents, and just opened each one in Inkscape on the projector during the presentation. This allowed me to demonstrate each new feature introduced, which worked pretty well. The link below is a ZIP archive of 11 SVG files. Slides from CMU ECE Build18 kick-off speech – Get Excited and Make Things! Build18 is an annual engineering festival held by the Electrical and Computer Engineering (ECE) department at Carnegie Mellon University and run by the ECE SAC and IEEE student organizations. Build18 was founded out of the belief that the ECE curriculum is too structured – there just isn’t enough room for simply tinkering with electronics and making cool stuff. It’s meant to give ECE students time to work on self-proposed, creative projects and to promote the fun and playful aspects of engineering. 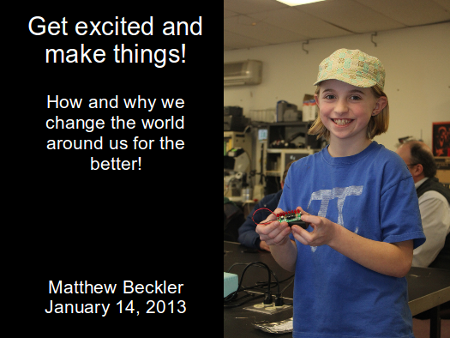 Based on my experience being part of the maker and hacker communities and my membership with HackPittsburgh, I was invited to give a kick-off presentation to inform and inspire the students taking part in the Build 18 “Build Week” in January 2013. These are my slides from that presentation. At CMU, each department is assigned a 2-digit number that is used as a prefix to that department’s course numbers in the course catalog; For the ECE department, our number is 18, hence the name Build 18. During fall semester 2012 I took a class entitled How to Write Fast Code. Among other techniques and technologies, we learned a lot about using GPUs for solving highly-parallel problems. 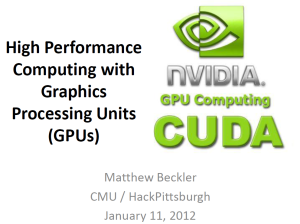 Since the material is quite interesting, I presented an overview of the subject matter at a HackPittsburgh Friday night talk in January 2013. The slides don’t fully “stand on their own” as I always try to just show images and then explain them in person during the talk, but they may be interesting to look at regardless.